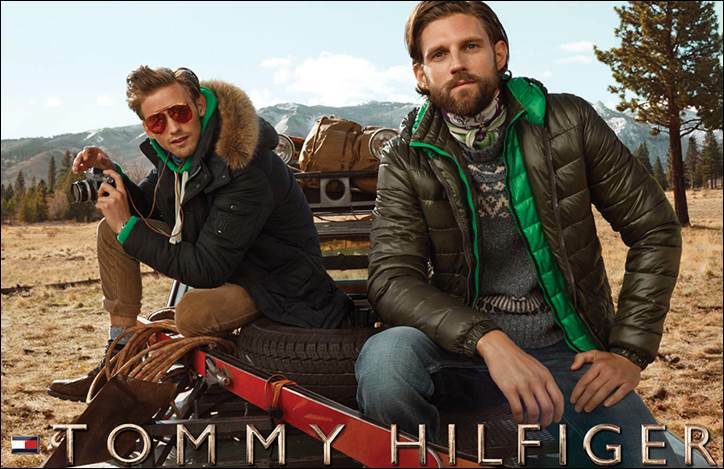 Tommy Hilfiger has released images from their global Fall campaign, la víe en rõpe. with the Hilfigers (his adopted family of models) bringing their act to Lake Tahoe this season. Craig McDean shot the campaign, with styling by Karl Templer and creative direction by Trey Laird of Laird + Partners. Once again, Tommy’s brought some of the older family members such as Arthur Kulkov, Julia Hafstrom, Bernard Fouquet, Marlon Teixeira, Luke Willett, and Daily fave RJ King with some new kids joining the fam, namely Malaika Firth, Ophelie Guillermand, Lexi Boling, Emma Balfour, RJ Rogenski, Conrad Bromfield, Abiah Hostvedt, and a St. Bernard named Buck. (Who is Buck’s booker?) One notable (and chic) change to their campaign aesthetic is the introduction of a new brass concept logo design. It’s set to appear on the campaign, in-store singage, and all associated materials. Look for the la víe en rõpe campaign to break this month all over the world.